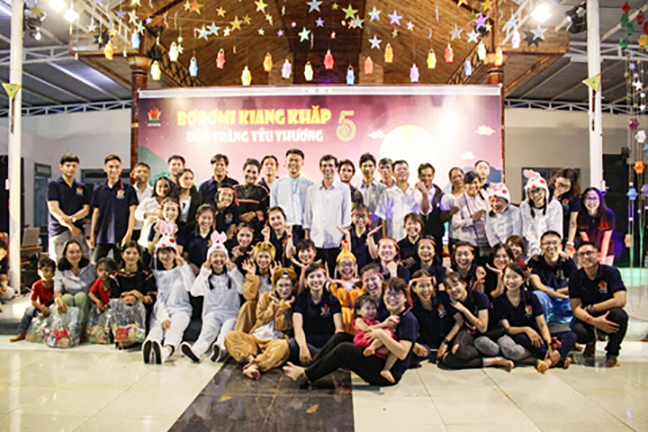 (Saigon, Vietnam) On the Mid-Autumn Festival, the Redemptorist Youth Missionaries guided by Fr. Alfonso Tran Ngoc Huong, CSsR. traveled to Plei kly to share the joy of the festival with the indigenous people from 21st evening to 23rd of September. 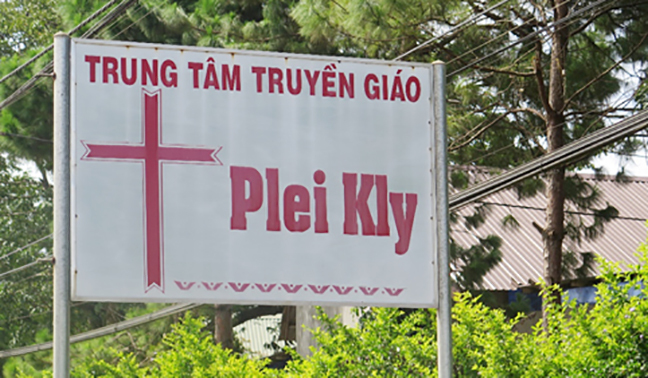 Plei Kly is a missionary center of Redemptorists in the Highland of Vietnam where the majority of local people belong to JRAI ethnic group. We left for Plei Kly at 8.30 pm on 21st of September 2018 which is about 470 km from SAIGON. It took us about 11 to 12 hours to reach there. 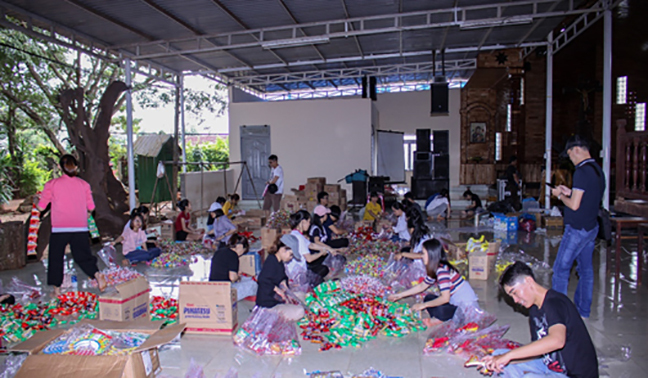 After arriving, we started packing the gifts together, and all were happy doing it together. Then, we were welcomed by Rev. Joseph Nguyen Dac Thinh. C.Ss.R. a Redemptorist missionary in Pleikly and then we had breakfast together. We were divided into 2 groups. 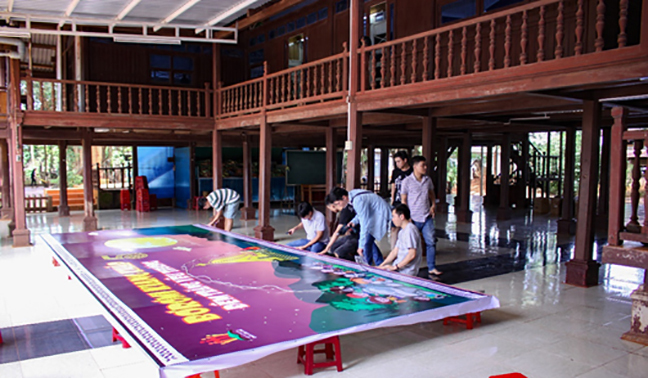 The first group “the design team” worked on setting up the stage for cultural evening programs and the other group wrapped 1,500 gift packets to be given to the families and children. We skillfully cut and stuck stars and colorful lanterns; set up background; and put cakes and candies with lanterns into boxes. 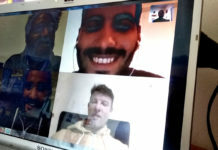 All of us worked together and thus created a lively atmosphere. 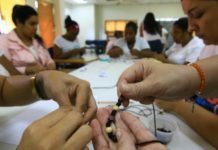 It was a new kind of experience where everyone was part of it and was excited about the task. On the other hand, a group of JRAI ethnic locals was preparing lunch. We ate the Agape meal together with local dishes prepared from bamboo shoots and manioc leaves. 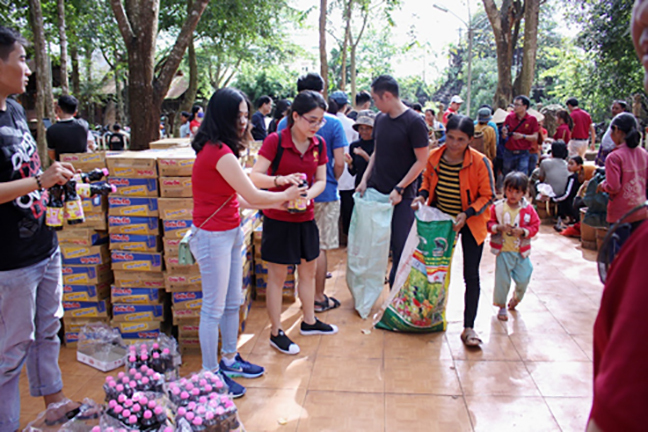 Around 3 pm, the RYM team distributed the packed gifts to the poor families that included rice, clothes, toys, etc. People were happy to receive the gifts. There were about 250 families who received gift packets. We thank God to all our benefactors who generously donated the gifts for the local poor families. The mass of Mid-Autumn celebration started at 6 pm, but the people and children started coming to the church by 5 pm onwards. Everyone took part in the Mass devoutly. Though It began raining outside; yet, the atmosphere inside was very holy and peaceful. At the beginning of the Mass, an entrance hymn was sung in the JRAI language. During, the homily Fr. Alfonso Tran Ngoc Huong told the children to live an honest life, to be happy and cheerful like the moon and trust in Jesus more and more because Jesus loves us all. There were many performances. The first one was a dance by the group and then followed by a dance of Jrai girls in their Jrai traditional clothes. 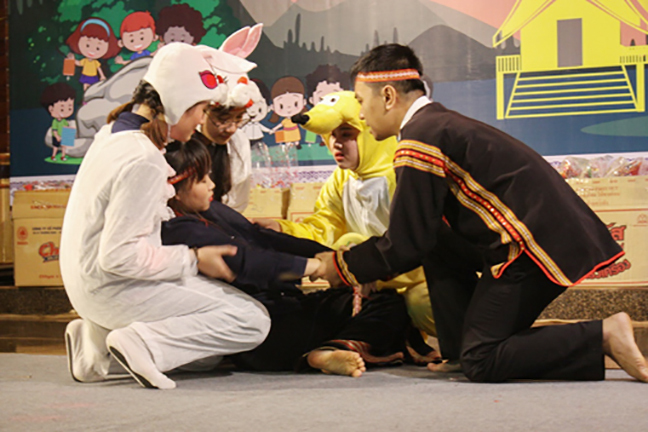 The youth presented a special play for Jrai children, called “Come back home”. The story was about the love between a mother and her son. In the scene, the loyalty of a dog and the help from different animals in a small forest depicted very well. The act ended with a dance to a familiar song with a message that all the children deserve to live in a happy family with parents’ love. Soon after the program, the children were given gifts. On receiving the gifts, the children were thrilled and excited. 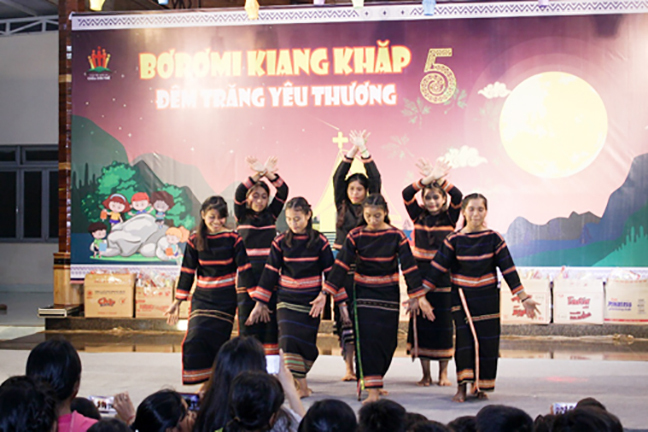 The children said Bơni to us (Bơni: means thank you in Jrai). It was really a great moment to see the children with smiling faces. Then we gathered for a photo shoot with two Redemptorists and JRAI people. Finally, our Mid-Autumn festival ended significantly and meaningfully. We had the taste of drinking rice beer and eating JRAI traditional food which made us closer to each other. The Sunday the 23rd was another busy day for all of us. Early morning, many children came to learn the Bible lessons taught by the older sisters and brothers followed by the Holy Eucharist. During the mass, Rev. Alfonso asked a question to the children: What can you do to help your parents? Many children answered spontaneously; some said that they mop the floor, to take care of their brothers or sisters, others can cook rice, help friends when they are sick. The innocent and simple characteristics of children touched our hearts and made us feel happy. In the afternoon, our group was divided into 4 teams to visit different villages. There are 4 villages: KLY PHUN, THONG A, TONG WILL, and CHƯ BOH I. Three of these villages were quite far, so we went by a vehicle called “MAY CAY”. 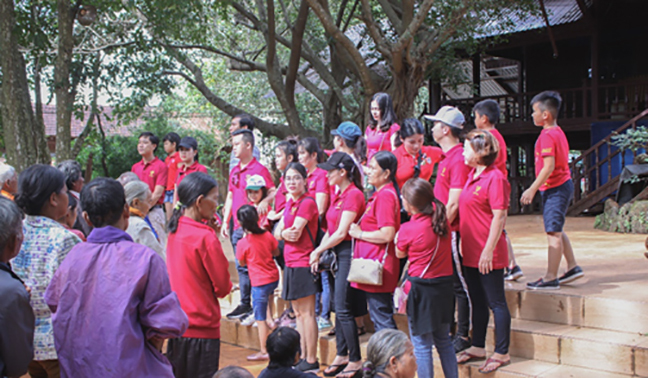 Another team walked to KLY PHUN village. 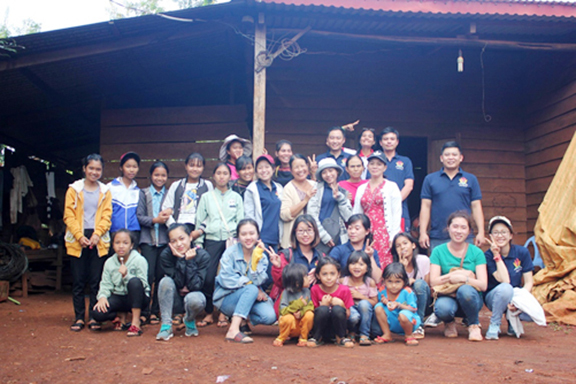 The local youth H’Chuyen and H’Thai directed the group. After walking about 1 km along the road, we reached KLY PHỤN village. We took some candies and cakes with us to give them to the children in the villages. On our arrival, the children gathered to receive the gifts. Then, we continued visiting some families, praying for the sick, giving communion and praying in the families. The rural surrounding was awesome. There were small houses. The cows and goats were grazing in the fields. It was so peaceful atmosphere which we don’t see in the busy urban setup and crowded cities. After crossing a few families, Raine invited other children to join us. Three girls – Changsu, Jory, and Thương walked with us from the beginning to the end. After that, we were led to so-called the “Promised Land” – a friendly name of a graveyard just outside the village. 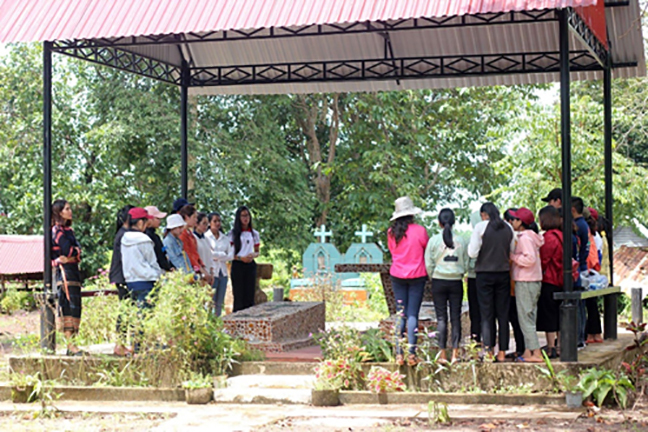 H’Chuyen told us that these were the graveyards of two Redemptorist Brothers Macco (Mark) Dan and Phero (Peter) Qua. The Redemptorists had close relationships with Jrai people during their missionary period. They considered this place as a promised land God gave them. Their last wish was to be buried after they die in this land so that they remain in close relationship with JRAI people here. We prayed for them. We continued our journey. We went across the streams passing by big bamboos and a large green field. 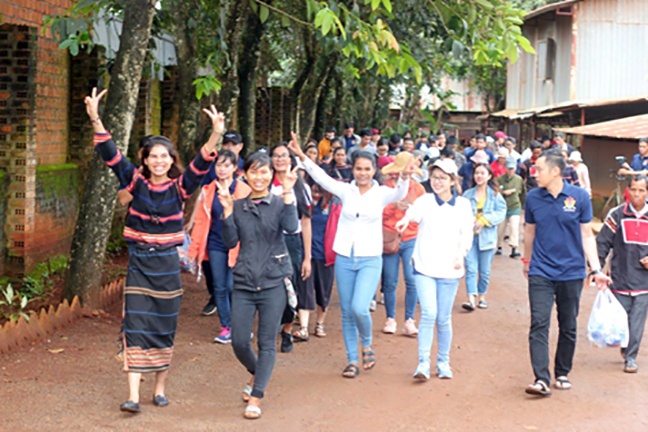 The youth group and people of JRAI visited together Plei Kly for the first time. After a long and tiresome journey, we reached senior KLY PHUN’s home. They welcomed us with songs and flower bouquets. During lunch, we tasted the local drink rice beer together. The village leader explained to us that KLY PHUN means “original stone village”. He told us a story that long time ago, there were 3 kings in the village (Potao): fire king, wind king, and water king. But when they knew and learned the Bible, they still keep 3 these kings but they consider God is the king of all. The people depend their livelihood on farming and growing chicken. Some wealthier families rear cows or goats. Though the people of JRAI and Plei Kly are poor still they live a happy and peaceful life. 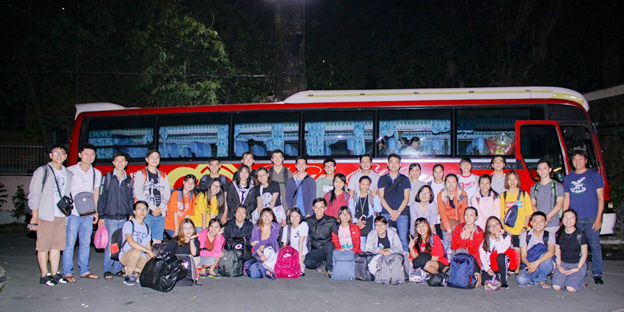 After visiting the villages, all of us gathered in front of the church and packed our baggage to return back to Sai Gon. We gathered in a circle and thanked Ama Thinh and all JRAI people, who welcomed us all. We reached safely back to Saigon with full of memories of Plei Kly and friendly Jrai people. Thanks be to God for the lovely experience and the opportunity given to us.